Mom always said, “If you can’t say anything nice, don’t say anything at all.” Mom also said to never tell a lie. Sometimes, Mom, it’s impossible to do one without the other. The compromise, in this case, is going to be a short and not so sweet review. 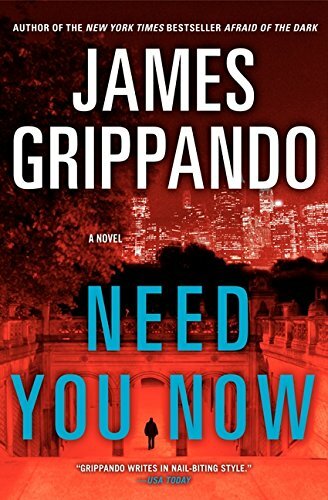 James Grippando, as a novelist, is an excellent craftsman. He knows how to tell a compelling tale, as evidenced by his high sales and ardent fan base. But as a storyteller, of late, he seems to be lacking in creativity. I’ll skip a synopsis. You’ve read many like it before. The synopses for a glut of novels could be plagiarized, altered slightly, and used to describe Need You Now. Primarily, the problems with the novel fall into two categories: cliché and logic defying implausibility. Cliché number one: The Witness Protection Program. Based on its repetitious fictional representation, one might believe that over half of U.S. citizens are in it. Further, one might think that there are tiers in the Witness Protection Program. A citizen is protected by it a first time, then has another mishap and enters it again with another identity, then gains knowledge of another crime, again assuring survival by the justice system in a Witness Protection Protection Protection Program. And, without risking a spoiler, author Grippando’s participants in the Program are, of course, innocent, having to enter it for the most noble of reasons. And also of course, the innocent unfortunate under federal protection is believed to be involved in a crime, so the government tries to get the truth out of him with the always convenient honey trap. And also also of course, the beautiful, disingenuous spy meant to destroy him develops genuine feelings for him, and voilà! Love is in the air. Believability: The plot revolves around the theft of $60 billion via a Ponzi scheme. A Ponzi scheme? A PONZI SCHEME! Really? Knowledge and support of this Ponzi scheme reaches to the highest levels of power. A genius quantitative analyst (they’re nearly all geniuses in fiction), commonly known as a “quant,” spends years dedicated to unraveling this Ponzi scheme. Umm . . . isn’t a Ponzi scheme made obvious by math as simple as double-digit accounting? Don’t they work largely because of lack of investor knowledge or competence? Don’t people investing such large sums occasionally demand an audit? Aren’t detailed annual reports usually required from major corporations? Sorry, but this Ponzi scheme, the foundation of the entire story, is too obliquely characterized for anyone with half a brain to buy into it—pun intended. Implausibility Round II: The antagonist is so wooden as to reveal absolutely no normal human characteristics. Compared to him, the Terminator could walk on water then turn it into a sea of wine. He does though, have a garrote with razor-edged saw teeth on it that makes severing a head as easy as snapping your fingers. That’s pretty cool.